It was an ordinary day inside Glassell Park’s Super King. The produce section was packed with a multi-ethnic, multi-generational crowd sifting through mounds of avocados and fresh herbs. As always, the glut of shopping carts were parked haphazardly in aisles that never seem to be wide enough, forming an obstacle course that must be cautiously traversed when you’re trying to get from the Persian cucumbers to the eggplants. That’s what I was doing when I clumsily stopped to do a double-take. An unmarked crate was brimming with nostalgia in the form of a fruit that I’d always thought was a vegetable. They were long and curved, sometimes looking like the letter C, other times forming hooks or strange twisted shapes. Their green skin was wrinkled, rougher on the eyes than to the touch. “Kutah,” I remember my late grandfather calling them many years ago. Armenian cucumbers. I hadn’t had one in decades, not since my grandparents kept a vegetable garden in their San Fernando Valley backyard. It had been so long since I even saw one of these that I thought I was imagining the association. I took a picture and messaged it to my mom and siblings for confirmation. As I filled a bag with Armenian cucumbers, a lady asked me how to cook them. I stared at her blankly. I don’t even know what I’m doing with them aside from living out a flashback to 1990s Northridge, and I’m probably the last person anyone should ask for cooking advice. Still, we always ate Armenian cucumbers raw. I told her that as I came out of my daze. Then I headed back into the crowd, continuing toward the eggplant. Armenian cucumbers! My grandpa used to grow these in his backyard. Haven’t had them in many years, but I will again tonight. I’m obsessed with Super King. It’s gotten to the point where I’ll text my family and post updates on Instagram—public service announcements, really—when string cheese is on sale. My husband, family members, and friends think I’m some combination of crazy and brave in my dedication to a grocery store that’s notoriously busy. They’ll mention the parking lot, small and so dense with cars that it can trigger lines that spill into the main road. That’s a non-issue for me. I take the bus, one that goes directly from Chinatown, where I live, to the store on San Fernando Road. As for the crowd, I’ve learned to deal with it. Those slim-cut aisles bulging with overflowing shopping carts and the lines that can snake into the bakery are manageable when you focus on the strawberries you’ll be eating as soon as you get home. I started going to Super King for practical purposes; they have what I eat. I’m not a foodie, but I’m particular about a few things, like yogurt and feta cheese. At most of my semi-local grocery stores, there’s high-priced Greek yogurt that tastes like it was made for people just starting a Mediterranean diet. Super King has Karoun plain yogurt, which is thick, silky, and works as well with fruit and honey as it does with cucumbers and dill. 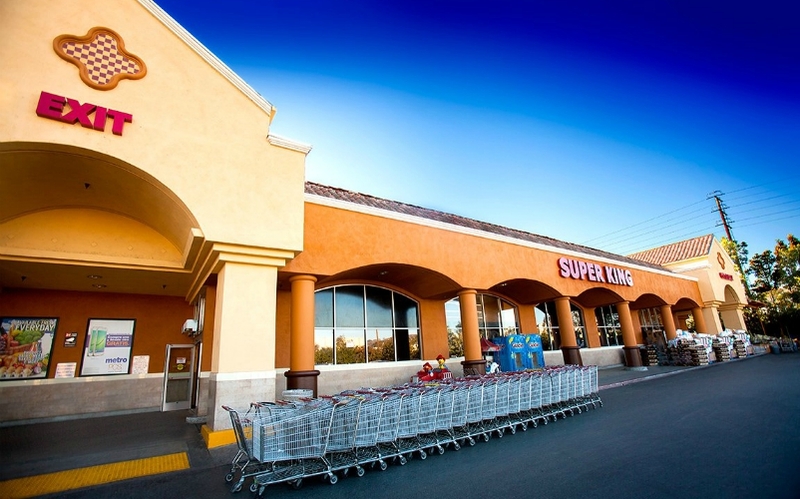 Where the feta at other grocery stores is often limited to a tiny package of salad crumbles, Super King boasts a variety of brands and sizes. But, the reason that I keep going to Super King is the sense of wonder that I feel when I’m combing the shelves. Super King bills itself as an “international” market, but really it’s the all-inclusive grocery store that speaks to modern Los Angeles. It’s the place where you can start to learn about the many culinary traditions that inhabit Los Angeles, where you can see the diversity of Middle Eastern, Latin American, Asian, and Eastern European food all in one trip. For me, it’s where I can learn about my own heritage as well. I’m of Armenian descent, but I’m also part of a third generation born in the U.S., so the Armenian food I know is based on decades of adapting to what’s available here. No doubt, there are more varieties of Armenian foods available in Los Angeles now than what my parents and grandparents were used to eating. Inside Super King, I’ll see script that I can’t read but that I recognize as Armenian, and then investigate bottled drinks and jars of jam thinking, Maybe I should try this. Then there are the moments of familiarity, like that bin of Armenian cucumbers. I had almost forgotten how good they were until I saw them in the store. That night, I cut up a couple of them and indulged in the taste of what had been a distant memory.